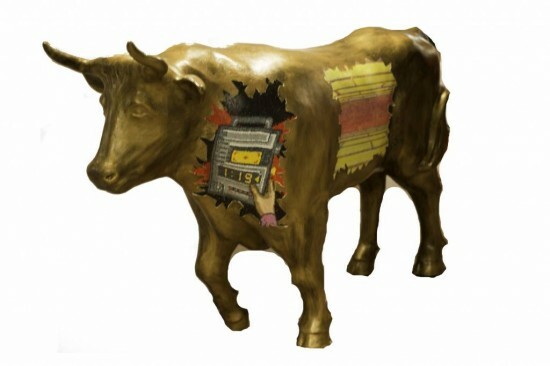 The DigiBull is an amalgam of the old and the new. My ox consists of acrylic paintings of pixelated images which break holes in a faux bronze skin. When I designed the DigiBull, I was thinking of art materials both old and new and the ways in which our interaction with art has changed over time. I turned pictures which are usually viewed on a computer screen into tactile, dimensional relief works to view and touch. I also imitated the look and feel of worn, weathered bronze without using a single piece of metal. My intention was to show how traditional art and digital images both use different forms of illusion to fool the viewer into seeing something that is not actually there.